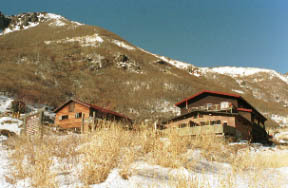 The lodge of the Kyushu highest place located in the center of a Kujyu mountain range, a Mt.Heiji-dake besides eight seats not less than 1700-m, etc. enclose, and it is 2-hour within the circle to every mountain. 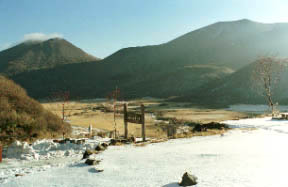 The Bougatsuru from a lodge, a Mt.Heiji-dake, a right-hand Mt.Daisen-zan. 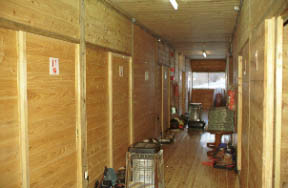 The whole of this ridge that can carry out shoes carrying-in dryness is a single room in the guest room building containing heating. 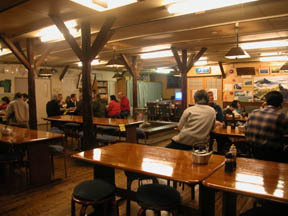 The dining-room where winter is also busy. 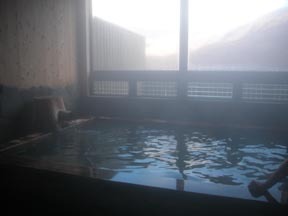 It was a sulfur spring of the clouded white before small explosion of a wooden bath cottage, the Yama-no Onsen of overflow, those of a sulphuric smell and hot water with a flower, Io-zan, and Heisei.